Valve springs play an important role in controlling the breathing in internal combustion engines. The valves are mechanically opened by a camshaft, via valve lifters or tappets, and closed by the valve springs. Overcoming friction on the valve shaft when the valve closes Creating enough friction, or drag, to keep the valve train and valve following the camshaft profile accurately, by always providing (slightly) greater force than the inertial force of the accelerated mass of the valve. At the same time, the valve-spring forces must not be so large as to create excessive friction on the cam and potential loss of performance. The force required to keep the valve closed (for a length L1) is referred to as the preload force F1. The force required to maintain accurate camshaft tracking at high revs (for a length L2) is referred to as the spring force F2. Eibach Valve Springs (EVS), are generally subjected to higher loads than standard springs. For this reason, EVS are manufactured from special, high-tensile-strength alloys of very high purity according to our own specifications and in our own proprietary production process. In our dynamic test series, the famous ´Woehler curves´ are determined for new materials, production processes and/or new design principles using a dynamic cycle tester specially developed by Eibach. We distinguish between two groups of applications: EVS Sport and EVS Pro Springs. EVS Sport Springs are primarily designed for long-term use, and are typically used for both racing and in road vehicles. EVS Pro Springs have been and are being developed exclusively for high- performance motor sport applications. Correspondingly, different materials, alloys and hardnesses are used and the parameters of the individual production processes are adjusted for the specific qualities of the materials. In addition, for springs in particularly demanding roles, the permitted stress range can be further increased through additional fine tuning of the production process. With regard to the dynamic behaviour of a valve spring, it must be considered that they have a lower resonant frequency than other components, meaning that they can easily be stimulated to undergo resonant vibration. This means that the spring, in the presence of an appropriate stimulus, no longer follows the cam profile exactly, which leads to periodic excess tension and variations in the contact forces – including possible failure – and thereby results in a loss of function which leads to a loss of performance. In the worst case, the excess tension can lead to the spring breaking. It can, however, also be observed when there is no resonance, that at higher RPM, the springs do not follow the cam profile exactly. There are two main effects that must be considered. Firstly there is the additional lift past the cam (known as loft), which leads to excess tension and secondly there is the bounce after the down stroke of the cam pitch, which results in the valve reopening for a short period. There are two options for examining the movement of the springs at different RPM. A laser can be used to record the movement of the valve, as this coincides with that of the spring. The second, more precise option is to measure the behaviour of the springs using wire-resistance strain gauges affixed to the springs. The gauges change their resistance as they are stretched and relaxed during the oscillation of the springs. The changing resistance is recorded, making it possible to calculate the deformation of the material and therefore the motion of the springs. These methods allow us to design springs with smaller excess tensions, resulting in increased dependability and reduced performance losses. Both procedures are used at Eibach, working in conjunction with our in-house-developed Valve Train Dyno, which is able to spin at up to 15,000 rpm and which provides crucial information for optimal valve spring design and performance. Because the resonant frequency is directly related to the spring rate and the mass of the spring, it is desirable to select as high a rate as possible, thereby increasing the resonant frequency, in order to avoid the occurrence of resonance within the engine´s working revolution range. Since, however, the limits of the stress range must be considered in designing the spring, in certain cases it is not possible to prevent the resonant frequency of the spring from falling within the working RPM range. 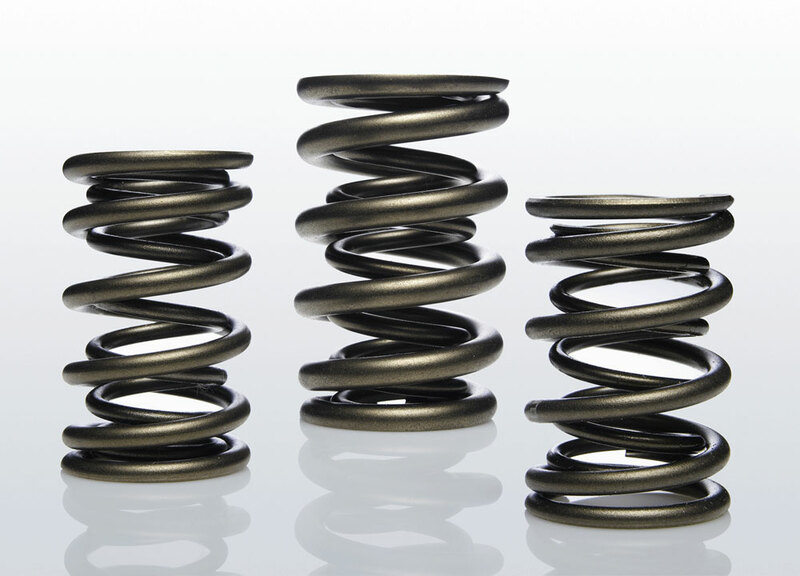 For progressive springs, the spring rate increases within the stress range, which also changes the resonant frequency. This means that the individual resonant frequencies are passed through for such a short period that no resonance occurs. However, because of fitting constraints, progressive set ups are not always possible. Inner and outer springs are used which rub together slightly, providing an engineered damping factor. If one of the two starts to resonate, the other damps out the motion before it can cause damage. This damping factor utilizes controlled friction, which can lead to a reduction in the life span of the springs. Therefore this solution is used in Motorsports only. Both conical springs and beehive springs make it possible to reduce the masses being moved – on the one hand simply through the spring´s tapered shape and on the other through the smaller upper spring retainer, which again leads to an improvement in dynamics within the valve train. In comparison with conical springs, beehive springs offer the ability to operate with frictional damping for spring sets in the cylindrical parts of the inner/outer springs. EVS Sport Springs are predominantly designed for use with OE retainers. In contrast, EVS Pro springs often require the use of custom retainers and locks, with titanium often being the preferred material. If there is sufficient demand, it is intended that Eibach will also offer these special components to complement EVS Pro Spring Sets.